Cutthroat trout, sea-run adult. Caught along the beaches of Hood Canal near Seabeck, Washington. Photo courtesy of Larry Coté. Cutthroat trout. Photo courtesy of Professor Peter B. Moyle. Cutthroat trout, sea-run adult, head. Caught along the beaches of Hood Canal near Seabeck, Washington in March 2008. Photo by Larry Coté. Lahontan cutthroat trout, photographed at Heenan Lake, California in October 2006. Photo by Michael Carl. Lahontan cutthroat trout spawning pair. Independence Creek, CA. Photo courtesy of Mr. Jim Gaither, The Nature Conservancy. Lahontan cutthroat trout, Heenan Lake, CA. Photo courtesy of Gerard Carmona Catot. Paiute cutthroat trout. Photo courtesy of William Somer, California Department of Fish and Game. PLEASE NOTE: The photos and information shown here are for the species Cutthroat Trout, of which the Colorado River Cutthroat Trout is a sub-species. Well developed teeth on jaws, head, tongue, etc. Cutthroat Trout have two distinct forms: the anadromous form or Coastal Cutthroat, and the inland Paiute and Lahontan cutthroat. The Coastal Cutthroat Trout and inland Cutthroat Trout are spatially separated by the width of California, and are thus quite ecologically different. Coastal Cutthroat Trout are found from Northern California up to Alaska. They are more strongly tied to freshwater than most of the anadromous salmonids, especially in California, and resident non-migratory populations exist. Most migration in California is limited to movement within a river system or to movement between a river and the estuary. 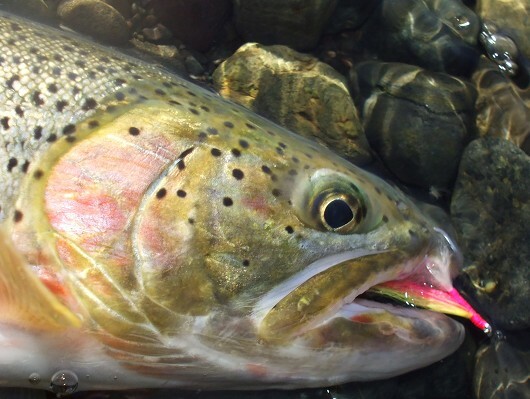 Cutthroat Trout that do enter the ocean rarely stray far from the mouth of their natal stream, and residence in saltwater is limited to summer months. Most of the Cutthroat Trout in California, including the non-spawning fish, return to freshwater during the winter or high flow months and hide in pools with complex forms of cover. Anadromous populations may reside in freshwater for up to five years before leaving for the ocean, where they are believed to loosely congregate in shoals. In their freshwater stages, Cutthroat Trout generally reside in small low-gradient streams with cool water temperatures in the range of 9-12°C and minimum dissolved oxygen levels of 5 mg/L. Juvenile fish are opportunistic feeders that rely mostly on benthic and drift insects. As freshwater Cutthroat Trout get larger they go from being the possible prey of other salmonids to the potential predators of other salmonids, insects, and crustaceans. In the ocean Cutthroat Trout continue to feed on fish and crustaceans and may broaden their diet to include new species of fish. Adult Cutthroat Trout will grow 5-10 cm per year with an adequate food supply in the ocean or a large river system. Spawners will not feed if they have sufficient fat storage, but will feed on insects and other forms of prey in freshwater if they need the energy. Anadromous Cutthroat Trout reach sexual maturity in 2-4 years and enter streams to breed with the first high flow between August and October. Female trout find reaches in their natal streams with gravel substrate, usually in pool tails. The females dig several redds and deposit eggs in succession while moving upstream. Males fertilize the eggs before the females cover the redds with gravel. Egg production increases with body size: females measuring 200-400 mm will produce an average of 1,100 to 1,700 eggs per spawning season. In California fry emerge in March-June after 6-7 weeks of incubation and a short amount of time spent as an alevin within the safety of the gravel. Cutthroat trout typically do not live longer than 7 years, with a maximum life of 10 years. The inland forms of Cutthroat Trout were historically one of only two salmonids found on the eastern side of the Sierras. They are found in small to large rivers and lakes with common characteristics of cool water and adequate dissolved oxygen. Inland Cutthroat Trout have a wide degree of tolerance for temperature, sediment, and alkaline conditions.They have been found to live in streams where the temperature exceeds 27°C, and found in lakes with a TDS of 13,000 mg/L and a pH of 9.5. Historically they were probably found in streams with abundant food sources and with a maximum water temperature of 23°C. Inland cutthroat trout, like the coastal forms, may have varying degrees of movement or migration. A fish may spend its entire life in a 20 m reach of stream, or may move many kilometers within a lake or river network. In streams they feed on drifting and benthic insects, whereas in lakes their diet may also include zooplankton, crustaceans, snails and other fish. Growth rates are temperature and food dependent. The largest recorded Lahontan Cutthroat, from Pyramid Lake, NV was 99 cm TL and weighed 18.6 kg. Paiute Cutthroat Trout, which are typically found in small high elevation streams, rarely exceed 25 cm FL. Inland Cutthroat Trout reach sexual maturity in 2-4 years. Spawning takes place in April through early July, with most Lahontan Cutthroat Trout moving up into tributaries of lakes and rivers to breed. Fecundity of Lahontan Cutthroats is about 400 - 8,000 eggs per female, a number that grows with body size. 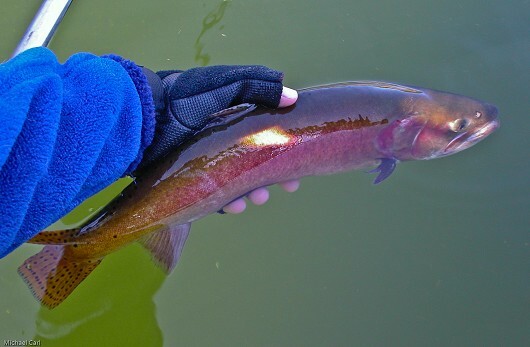 Paiute Cutthroats only produce 325 - 350 eggs per female. Lahontan Cutthroat Trout may spawn up to 5 times whereas Paiute Cutthroat Trout only spawn once in a life time. Maximum expected ages are 9 years and 3 years, respectively. The eggs hatch in 6 - 8 weeks, though the alevin remain within the substrate for up to 2 weeks before emerging into the water column. Young Lahontan Cutthroat Trout often move into a lake for a year while young stream dwelling Cutthroat Trout stay in the stream margins to feed.